Featuring rare concept cars from the early 1930s through the 21st century, this exhibit showcases some of the most forward-thinking vehicle concepts ever created by the top names in the automotive field. Dream Cars at the IMA includes conceptual drawings and scale models while it explores the evolution of revolutionary automobile design – a body of creative work that pushed the limits of the imagination and shaped the future of the industry. 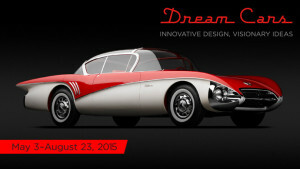 Dream Cars features both American and European concept car designs. The experimental, concept, or “dream” car has long been a dynamic tool that allows designers to showcase and demonstrate next-generation automotive design ideas. Concept cars were not vehicles the public typically could purchase, but rather the testing ground for innovations that might find expression in automobiles produced years, or even decades, later. This exhibition explores the groundbreaking designs that sparked ideas of future possibility and progress. This exhibition examines the dream car through five themes: independent makers, the impact of styling, the Motorama and the rise of the dream car, the influence of automobile shows, and the role of concept cars today. To help you learn more about Dream Cars, the Indianapolis Museum of Art has several interactives and activities that you can enjoy before, during and after the exhibition.